The marketplace is sending signals it wants verified sustainable beef, and the new VBP Plus program gives producers a way to show they are doing just that. Photo: Canada Beef Inc. The newly launched Verified Beef Production Plus program is taking Canada one step closer in its quest towards verified sustainable beef, says one of its designers. “This is just from my perspective, but we have always had early adopters — the people who believe in it — but there have never been clear market signals,” said Cecilie Fleming, chair of the committee that revamped the original VBP program. VBP Plus builds off the original Verified Beef Production, which focused on on-farm food safety. The new, voluntary program — open to cow-calf producers, backgrounders and feedlots owners — contains modules that address animal care, biosecurity, and environmental sustainability. 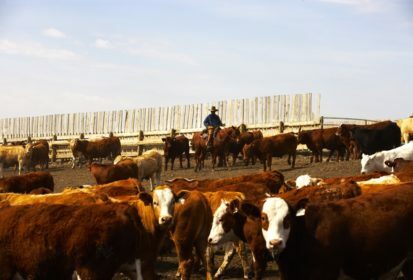 It is part of the Canadian Cattlemen’s programming, approved by the Canadian Food Inspection Agency, and meets the Canadian Roundtable for Sustainable Beef’s recently drafted indicators for sustainable beef. The rollout of VBP Plus also seems timely, since retailers such as Earls Restaurants and McDonald’s have recently put an emphasis on sourcing sustainable beef. But the timing is coincidental as VBP Plus has been in development since 2013. “This is part of the push to define sustainable beef and our program is one of the programs that can make that happen,” said Fleming, who raises Angus seedstock near Granum. “My phone, and the provincial co-ordinator’s phone, has been ringing off the hook. Before this was coming, people knew it was coming and they wanted it, especially after a lot of discussion and social media came to light with Earls. Consumers’ growing interest in how cattle are raised means food retailers and the food-service sector are also interested in sustainable beef, said the national manager of VBP Plus. VBP Plus will “mirror” the standards being developed by the Canadian Roundtable for Sustainable Beef, added Fleming. VBP Plus is a national program administered by each province and was built off the National Beef Code of Practice, national biosecurity standards, and components of each province’s Environmental Farm Plan. Any producer who has taken VBP will have to sign up to take the additional modules. Some beef programs require an audit, and that option is available to anyone in the program. Many producers find that they need to make some adjustments to their operation once they have gone through the audit. Producers, industry professionals, scientists, and members of the sustainable beef roundtable were involved in the development of VBP Plus. Nearly 20,000 operations across the country are trained in the original VBP, and between 1,300 and 1,400 are already fully registered in VBP Plus (which means that they have gone through an audit). Producers on the program have to maintain a certain level of record-keeping, complete self-assessments, and be open to voluntary audits, but they are not subjected to third-party audits every year. The fee for VBP Plus ranges from $400 to $750, depending on the complexity of the operation audited. The fees pay for the cost of the audits. Producers who want to participate need to get a copy of the producer manual and follow the summary checklist, which defines the outcome of the program. Any producer who has gone through the McDonald’s pilot program will already meet many of the VBP Plus requirements. For more information and details on how the program works, go to verifiedbeefproductionplus.com and click on the Registration or the Forms and Manuals tabs.